Hi guys, I moved from Inverness a long time ago and try and get back once in a while. 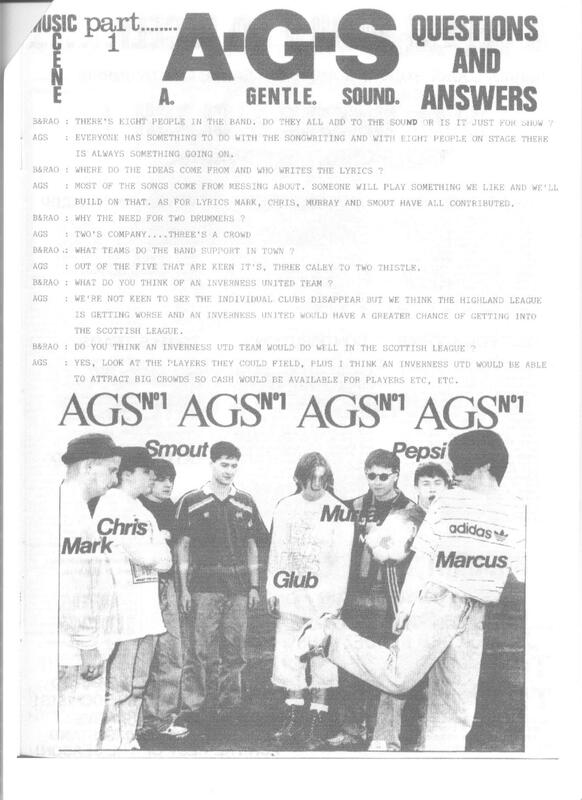 I'm having a bit of a flash back of a band called AGS A Gentle Sound, they had a song called "a gentle sound" think I had a compilation tape called Groove Machine. Bought from market brae record shop. Around at the height of the baggy/indie era late 80s. I don't have a copy of their tape though, sorry! Some time ago i was asked if i had any pics etc from my time in AGS...I did, so i created a FB page for ex band members, crew and fans to share their memories. There are lots of pics from gigs, songs from our 1st King Tuts set and lots of unseen stuff from our trips around the Isle! Feel free to pop in and share your memories! Not just of AGS but those wonderful years of flares, joe bloggs, tie dyed hooded tops, Adamski, 808 State, the Roses & the Mondays etc etc. And of course the Merger was in its infancy then but very relevant topic of the times. Who knows i may even share the story of our plan to shoot a video using the 3 Inverness teams grounds. Its a closed group only but you can request to join.